House Nagelschmidt for 'holidays with the whole family'. Our lovely furnished holiday apartment up to 4-6 persons was awarded with three stars by the German association of tourism. If you are looking for relaxation and good air, if you love hiking, forests, mountains and wide meadows, it is the perfect place. The house, surrounded by an orchard, is located on the edge of Schwend, close to the cities, region Amberg, Sulzbach-Rosenberg, Neumarkt and Hersbruck. There is no main street traffic. Only a 5 minute walk separates you from the forest. To visit the city of Nuremberg and the Nuremberg exhibition, like Consumenta, toy exhibition, BioFach, recreation, garden, etc. we offer our apartment as an accommodation also with a private room with breakfast. The exhibition Nuremberg can be reached by the A6 highway in only 20-25 minutes. Guests from the United States of America and Great Britain are also very welcome. Vilseck, Grafenwöhr and Hohenfels can be reached quickly by car. Entertainment in and around the house: Would you like to play table tennis or football? Both can be found in our table tennis room. Please do not forget to bring along your own paddles and balls. Would you like to have a barbecue on a cool summer evening? This is possible in our garden. Barbecue is available. If the fruit is ripe (cherries, apples, plums, pears), you can eat as much as you would like free of charge. Visit our large neighbouring cities! 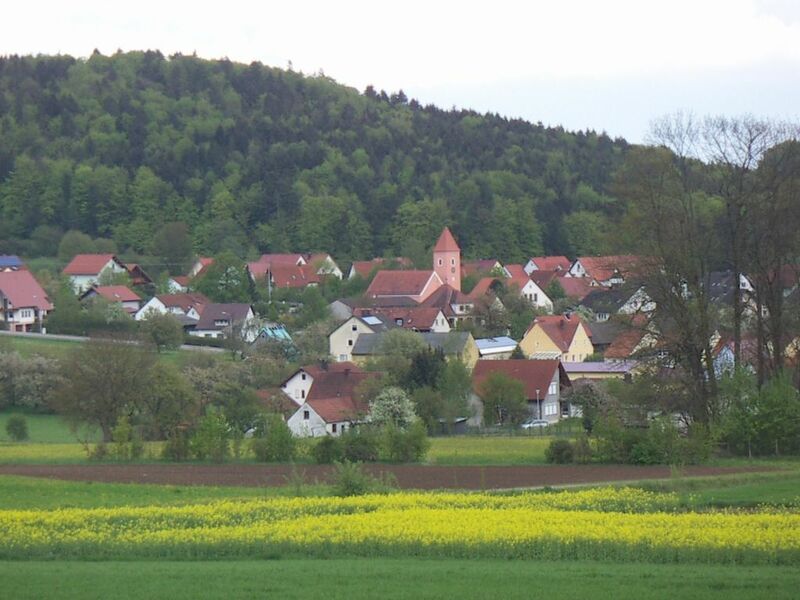 These are Kümmersbruck with the Schweppermann barracks, Sulzbach - Rosenberg, Lauterhofen, Kastl, Illschwang, Neukirchen, Ursensollen, Ammerthal, Pilsach and Alfeld in Middle Franconia. For events in the stadium in Nuremberg and the surrounding area, we offer our apartment as an inexpensive residence and accommodation with breakfast. The arena is just a stone's throw away, about 45 km with the highway / 25 minute ride from us. Bikes, hiking: We would be happy to offer you our bikes free of charge with good weather. Mostly well built bike paths and other streets lead through the charming landscape. If you are a hiker, you will find more than 30 km of paths around us, for example to Bärenfels in Frechetsfeld or to the burg ruins of Lichtenegg, both with a stunning view or also only a small tour 'around the Schwend'. Those who love orchids will enjoy May and June. We will tell you where lady's slippers or martagon bloom in free nature. Only 5 km to the south and you are already in Brunn in the Lauterachtal. There you can buy trout, live or smoked from the clear, fresh Lauterach and prepare it at home. What is better? We would be happy to rent our holiday apartment as a room, accommodation and residence for workers, assemblers, company members, apprentices, etc. from the Sulzbach-Rosenberg area, town Amberg and the district of Amberg-Sulzbach, Hersbruck, Nuremberg and the Nuremberg Land, Neumarkt, Lauterhofen, Pilsach, Altdorf, Alfeld, Illschwang, Birgland and the surrounding area. You can get to all destinations quickly through the highway A6 (2 km away). There are 2 bedrooms with double beds and 1 large combined living/bedroom with chairs and double beds. Bedlinen is included in the price. The beds are then made for your arrival. Towels if required/piece 1,- / bath towels € 2,-. If you tell us in advance, a small to medium-sized dog or cat can be brought along for € 3 per day. We had a group in the area for work. This was a great home to come and relax after a long day of meetings. As my friend had said during the trip. It’s like being at your grandparents home. Very calm and enjoyable. There is plenty of space and it’s an excellent price. The only caution is the WiFi is very slow. If you have something to work on with internet, it will take some time. The owner is a very hospitable and welcoming gentleman. I highly recommend this house. Great hosts and a great location! We really enjoyed our time in Karl and Barbara's apartment. It was a spacious home for 4 people and was spotlessly clean. Karl and Barbara were wonderful and generous hosts, who live nearby, and were available at any time to help. We enquired about bicycles and within minutes Karl had 4 bikes ready with tyres pumped and brakes and gears checked!! We really enjoyed the area and the surrounding small villages. It was a short drive to Amberg and Nuremberg, and we particularly enjoyed exploring the historic centre of Nuremberg. We found Barbara to have good English skills and she was able to give us good local advice. In summary - a good apartment, in a pleasant location with outstanding hosts! Wir haben uns über Ihre positive Bewertung sehr gefreut und sagen nochmals herzlichen Dank, dass Sie bei uns waren. Barbara und ich wünschen Ihnen alles Gute und wir hoffen, dass Sie immer eine angenehme Erinnerung an Ihren Urlaubsaufenthalt in Schwend in Bayern haben. Great place to relax and feel at home! This is the 2nd time I have stayed in Haus Nagelschmidt. Karl and Barbara were great hosts. They made us feel right at home in Germany. Schwend is a quiet town to relax. Location is great being located 30 miles from Nuernberg and right off the Autobahn. The place is clean and has everything you need. There are lots of attractions near by. Karl can give you lots of suggestions and help find anything you want to see. The local restaurants are great! We ate at several in various nearby towns to taste the local foods. The countryside is very lovely but Amberg or Nuernberg is just down the autobahn if you need city life. I think of Karl and Barbara as part of the family now and hope to return soon. We spend a week in June of 2010 in this lovely and comfortable Apartment. We had booked the 3 bedroom unit, a 2 bedroom and a 1 bedroom was also available. Mr. and Mrs. Nagelschmidt made us feel at home. Very spacious and had everything what you would need in a home away from home. Easy to find from the Autobahn. If you like to see the german countryside this is the place to go. Quite but within easy access to Nurenberg. Small towns in the neighborhood had great restaurants, small shops and Caffees. Museums and old buildings with unique charm could be found all around. Can highly recommend it. Also see www.haus-nagelschmidt.de for links and more information. Delf and Michiyo, Golden, Colorado, U.S.A.
Ce logement est bien situé et équipé, proche de l autoroute pour découvrir facilement cette belle region pleine de charme. La maison est très calme et propre. Les propriétaires sont très accueillants et disponibles si necessaire. Wir wurden sehr nett empfangen und die Wohnung ließ kaum Wünsche offen. Geräumig, voll ausgestattet und sehr sauber präsentierte sich unser Heim für die nächsten 5 Tage. Selbst Fahräder hätten wir nutzen können, was unser Programm jedoch leider nicht zuließ. Die ruhige Lage ließ echtes Urlaubsgefühl aufkommen. Sollten wir wieder mal in der Region sein, würden wir gerne diese Wohnung wieder nehmen. Auch wir freuen uns, wenn unsere Urlaubsgäste zufrieden sind und sich in unserem Haus, in einer ruhigen- aber dafür abwechslungsreichen Landschaft wohl fühlen. Über die nur 2 km entfernte Autobahnanbindung an die A6 sind Sie nicht am Ende der Welt. Im Gegenteil, die meisten Sehenswürdigkeiten in der schönen Oberpfalz, im Frankenland und auch in Tschechien sind schnell, problemlos und verkehrsgünstig erreichbar. Herzlichen Dank, dass Sie sich die Zeit genommen haben, unsere Ferienwohnung zu bewerten! Schwend, Birgland, is located in Sulzbacher Bergland in a relaxing middle mountain location up to 659 meters above sea level. You will find 3 well heated pools nearby. In our welcoming city of Amberg, there is a great water park with a 80 m slide. Moreover, you can visit the brand new Frankenalb spas in Hersbruck. Through the nearby highway you can quickly reach the old imperial city of Nuremberg with the Christkindlesmarkt and many attractions like Nuremberg Castle, Lorenzkirche, main market, toy museum and zoo. Or you can look at the historical city of Regensburg with its cathedral, the Danube and the Stone bridge. The Frankish Alb and the inviting cities Lauf, Schwandorf and Neumarkt can also be reached easily. Great excursions can be taken to the Frankish Switzerland with its caves, summer toboggan runs and wall climbing or you can visit the romantic Altmühltal valley. You can quickly get to the Playmobile-Fun Park Zirndorf or also to the nearby Czech Republic. Golf: Stunning 18 hole golf courses are located in the surrounding area and throughout East and North Bavaria. So the Lauterhofen golf course is only 6 km away, the Jura golf course with the golf academy in Hilzhofen/Pilsach 16 km and the golf course Königstein, about 25 km away. More courses are in Neumarkt/Pölling and in Schmidmühlen, both about 30 km away. Der Preis gilt für 2 Personen. Jede weitere Person je nach Saison pro Tag € 10,00 bis € 12,00. Endreinigung optional € 40,00. An Messezeiten der Nürnberg Messe gelten andere Preise. Bitte fragen Sie bei uns nach. Die Wohnung wird nicht an Monteure oder Bauarbeiter vermietet.